The Nuheara IQBuds are a pair of wireless earbuds that are a whole lot smarter than Apple's AirPods. They can't track fitness like the Bragi Dash or the Jabra Elite Sport, but if you care about the way you hear sound and what you hear, then they're going to have some appeal. The IQBuds act as regular wireless earbuds but they are all about letting you take control of what you hear, enhancing the ability to hear in crowded places and even merging music with real-world audio to give you a better sense of your environment. If that sounds familiar that's because it's exactly what Doppler Labs' Here One Active Listening buds offer up as well. 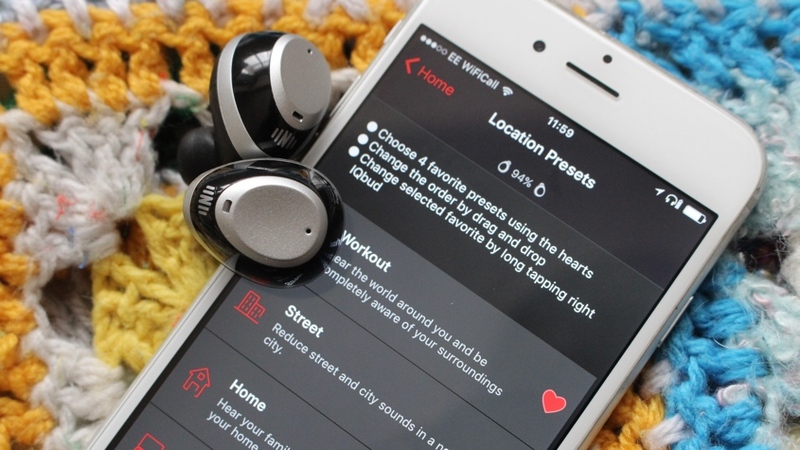 Nuheara made its hearable happen raising just shy of $800,000 on Indiegogo and launched on time with no delays. The $299 smart buds match the Here One's for price, but do they do deliver goods when it comes to augmenting audio? We've been living with the Nuheara IQBuds for a few weeks now to find out. Away from Apple's toothbrush head look, we've quickly come to expect that smart earbuds are cut relatively from the same design cloth. These are in-ear headphones with the wires cut off. With the extra computing hardware on board though it does mean that the bulk has to go somewhere and that can often lead to these buds looking quite big sitting inside of your ears. The IQBuds are not to dissimilar in size and stature to Bragi's Dash or the Jabra Elite but they do feel a bit more business-like when you compare them to what Doppler Labs has managed to come up with. They're not ugly, but they're by no means sleek or stylish either. The good news is that they're light with each earbud weighing just 8g. You can barely feel the IQbuds when they're in and they stay put as well. There's eight pairs of ear tips to choose from and they're really easy to secure in place. When you need to put them to more rigorous use like a spell in the gym or out on a run, the sweat can have you calling out for some kind of earhooks to keep them in place, but thankfully we can say they've never fallen out or really threatened to. The Nuheara smart earbuds are sweat/water resistant, but that doesn't mean you should jump into the water with them. We're talking being built for a bit of rain and not going swimming with them in. When it comes to taking control, Nuheara keeps things simple with touch sensitive surfaces on the outside of each buds. It's all taps and no swipes with the controls on the left bud designated for music and managing phone calls. You can play or pause music, activate Siri or Google Now with a double tap or a long tap to reject/answer a call. On the other side, you've got your Environment settings letting you toggle through different sound profiles, making it pretty effortless to move from different listening modes. The inability to skip tracks or adjust volume in music mode is missed and hopefully is something than can be added into the mix at a later date. Nuheara just like Doppler Labs, Bragi or Jabra wants to deliver quality audio when you're listening to your music or taking a phone call and thankfully we have nothing but good things to say about how well the IQBuds perform. The high fidelity speakers on board and digital mics packed into each earbud perform admirably. There's plenty of clarity and crispness on voice calls while music streaming impresses as well. Once you've found the perfect pair of eartips the IQBuds strike a good balance between offering deep, rich bass and plenty of detail as well. We'd still be inclined to say that Jabra and Bragi's offer a better all round audio, but these buds are not too far off. We should also give a mention to the noise cancellation performance, which is very impressive. In-ear headphones are not universally renowned for their abilities to fully drown out all of the environmental sound, but the IQBuds do an admirable job of blocking out the world around you. Out running or on a busy commute, it certainly does a good job on this front. So let's talk about those smarts and taking greater control of your audio. We've already mentioned that you have some limited control from the earbuds, but you really need to spend some time getting to know the companion app (for Android and iOS) and what they're truly capable of. Once you've successfully paired the buds it's time to get to know the location presets, which are essentially audio profiles created for different environments. So there's workout, street, home, office, restaurant, driving, plane and music. All of these different profiles create audio settings that best suit those environments. So for the restaurant mode it'll amplify speech and reduce background noise and in plane mode it'll lower aircraft noises. Music mode will entirely turn off the world around you. For each of these profiles you can make further adjustments including controlling the Real World Volume. This dial lets you decide whether you want to hear more or less world noise controlling the balance between world noise and speech. But there's more. You can also control bass and treble levels from the world EQ and tinker with SINC, which controls the balance between world noise and speech. Away from these presets you can create a personal audio profile, which lets you adjust settings like balance control for the individual earbuds. It definitely pays off finding what works for you best and that can take time. So that's what you can do, but how well does it work? We tried out as many of the location presets as we could and it's fair to say that it's a odd experience when you first try them out. In the home profile, we were able to drown out sounds like the humming of a fan but still pick up conversations or the sound clearly from a TV programme. In street mode, you really can reduce external noise without entirely sacrificing your awareness. Is Vi up to the task of being your new running coach? In workout mode, we went out running, but merged music streaming with the location preset. As a result, we could hear the most precise sounds like the jingling of a a dog collar and dinging of a bike bell from behind us with such detail all without sacrificing or muddying the audio. On thing we would add in that particular scenario is that you do still get a little bit of wind noise, but it's a pretty impressive experience all round. Some profiles make more sense than others. While it's clear that these IQBuds might be seen as some halfway house between hearing aids and noise cancelling earbuds, would someone want to have these sticking in the ears while having a conversation in a restaurant? We're not entirely sure. What you can't doubt is that Nuheara gives you plenty of control of what you want to hear and makes the possibility of augmenting audio in really effective way all possible. Battery life and Bluetooth connectivity. Two things that we have often been critical of with the first wave of smart earbuds. It's a case that these buds can't match wired Bluetooth headphones for stamina and that Bluetooth connection can often get quite easily disrupted if not positioned in the best place. In the case of the IQBuds, it does okay on both fronts, but there is definitely room for improvement. From a battery point of view, you can expect to get 4 hour off a single charge of the 100mAh battery, which is pretty much what we've found in our time with them. Some times it can be closer to three and a half hours. Like other smart earbuds, the IQBuds greatly rely on a charging case not only to stop them from getting lost, but also to increase battery performance. So if you've got the case fully charged, it can muster up 16 hours of Bluetooth streaming or 32 hours in listening modes. It makes a big difference that the buds are quick chargers when they do run out, powering up from 0-100% in an hour. The charging case makes the battery status very clear. On the outside there's a set of LEDs and a solitary button that when pressed for longer than a couple of seconds quickly indicates whether you're playing with 25, 50, 75 or 100% powered earbuds. As far as Bluetooth connectivity, the fact that the manual provides tips on getting optimal Bluetooth signal suggests that there could be problems. In fact there was only the odd occasion using it in the gym with our phone lying down away from the buds that we had some problems. The closer to the body, the better basically. Nuheara IQBuds deliver on what they promise. The ability to take better control of the sound around you without compromising on the audio quality we'd expect from a $300 hearable. It doesn't escape from some of the issues we've confronted with other smart earbuds though, namely the not so fantastic battery life and the odd Bluetooth choppiness. Compared to its only rival, the Here One, it does lose out in the looks department and we'd have loved some more control over music playback as well. The IQBuds though offer a good alternative to what Doppler Labs has come up with, we just hope there's more to come from these audio augmenting earbuds.